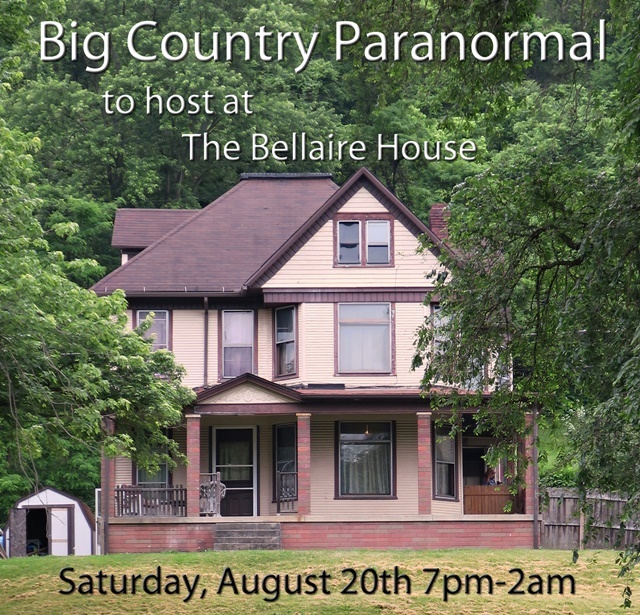 The Bellaire House has extended an invitation to Big Country Paranormal (BCP) to host a public investigation on August 20th from 7pm to 2am. We, Big Country Paranormal, are happy to lead a group of people wishing to participate in a paranormal investigation. Our team of experienced Mediums & Sensitives will explain what we do with our special gifts. We will also show you what kind of equipment we use to collect evidence. Kristin will also have equipment available hands-on for you to use. The BCP team will be happy to answer any questions you have about investigations or what we do. Once everyone has gotten a history and introduction to investigating, we will start doing some serious investigating. This investigation is less for thrill seekers and more for people seeking evidence of spirits. We encourage you to bring your own equipment you might have. Many people use their ipad or cellphone to record audio for EVPs. Others bring their digital camera, in hopes to catch a shadow figure. Time: 7pm to 2am. You can leave early if you wish. Links for tickets: http://thebellairehouse.webs.com Scroll down the page to find the event and then choose general admission tickets for the VIP tickets. If you have any questions, feel free ask in the comments section below or on Facebook.